Jim Webber reports…Australian whaler George Stubbs, who drowned in 1838 near Kapiti Island, was described at the time by the editor of the Sydney Monitor as “a good specimen of our Australian seamen, that is of our native youth, than whom a finer race of men for courage and enterprise as never seen in any land”. The recently-found story in the newspaper said he was employed in an American ship for the season, and he and four others were drowned when their whaleboat capsized in a gale. Stubbs, one of nine children of convicts Esther Spencer and Thomas Stubbs, was buried on Motungarara Island, where he lived, the funeral attended by the captains of the English and American ships. 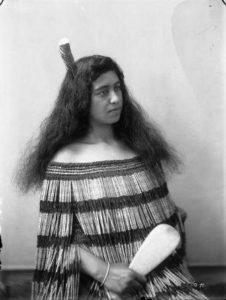 After his death his wife, the notable Waipunahau, took their sons Wi Parata and Hemi Matenga, to live at the Ati Awa pa at Kena Kena. Wi Parata became MP for Western Maori in the 1870s and was a supporter of the pacifist leader Te Whiti. His son Wi Naera was imprisoned with other followers of Te Whiti for opposing the Taranaki land confiscation at Parihaka. Parata’s youngest daughter, Utauta (pictured right at Parihaka in 1898), married Hona Webber, son of William Webber and Heneti Tahiwi, and they moved to Waiorua Bay on Kapiti in 1909 to oppose Crown land acquisition.